Big, bloated, bombastic, Thugs Of Hindostan is a period saga that banks solely upon action and spectacle for impact. The characters that populate it are, like the thousand ships that the film launches in the service of a bitter early 19th century battle between the fast-expanding British East India Company and a band of intrepid rebels who refuse to be enslaved by a foreign power, are as flimsy as cardboard. Thugs Of Hindostan barely ever hits terra firma. And when it does on the rare occasion, it fails to stay rooted long enough for those moments to make a difference. 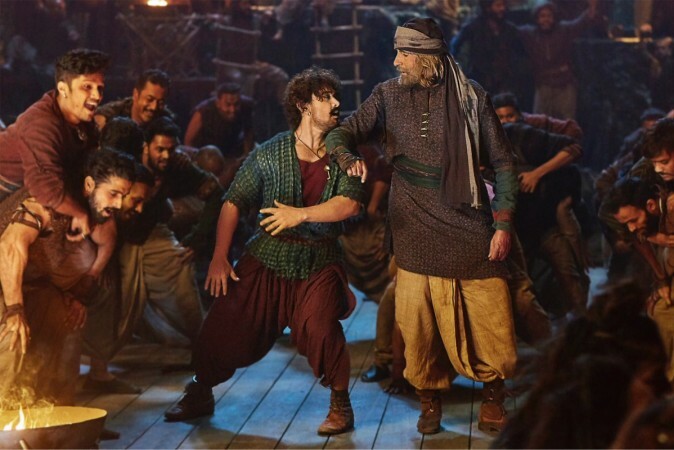 A gravelly-voiced Amitabh Bachchan and a puckish Aamir Khan bring everything that they have – the combined weight of the two superstars is undeniably significant – to the table, but director Vijay Krishna Acharya’s screenplay and the film’s big-budget surface veneer lack the solidity to guide this overwrought vessel out of the deep waters. What this aspiring blockbuster proves conclusively is that no matter how glossy a film is and how unique it might seem in the Indian context, there can be no substitute for an intelligent script and enterprising direction. Thugs Of Hindostan is all sound of fury: there is no dearth here of cannons and guns, bows and arrow, and swords and daggers. However, the narrative weapons it presses into service are hopelessly blunt and ineffective. It tries hard to impress but hardly ever does. Amitabh Bachchan plays Khudabaksh Jahaazi, a dyed-in-the-wool patriot who marshalls his people against a tyrannical British officer named Clive (Lloyd Owen). Is he the Robert Clive that we know from our school history books? It really doesn’t matter. For one, Robert Clive died well before 1795, the year in which Thugs Of Hindostan opens. The character is, of course, ruthless in dealing with the Indians that he has been sent out by the Empire to tame and exploit. The heroic and invincible Khudabaksh, on his part, is completely beyond the control of the Company. He spouts philosophy about bravery, trust and the courage to dream. He declares in one scene that freedom isn’t a dream. It’s a yakeen, a firm belief. The veteran actor delivers that line – and all the others peppered though the film – with customary panache, but given the confused tone of the film – it flits between the earnest and the frivolous – that piece of dialogue is lost in a maze of dramatic detours. Aamir Khan, complete with kohl-lined eyes, ear rings and a nose pin, slips into the skin of a shifty Firangi Mallah, a duplicitous mercenary who thinks nothing of repeatedly switching sides for a few guineas more. His character is placed here as the counterpoint to the imperious Khudabaksh. Betrayal is the man’s defence mechanism. When he is called upon to shed his deviousness, he has to grapple with conflicting impulses. Had he played the role with a little more subtlety, it might have passed muster as a variation on the classic anti-hero. Thugs Of Hindostan is also a tad mixed-up in its idea of religions and cultures. While the principal characters are mostly Muslim, the rituals that they perform reflect Hindu practices. Is this a blow for positive integration or just plain negligence? The climax of the film unfolds in a fort on a Dussehra day and the burning of Ravana, symbolizing the triumph of good over evil. The cliché is couched in what could be seen as a departure from norm – it is one of the two heroines who gets to slay the demon. There can be no denying that the film has been well shot. But the rather garish backdrops and the frequently shoddy, unnecessarily flighty VFX undermines the work of cinematographer Manush Nandan. Although the makers of this film have chosen to set the action two centuries ago, both the musical score (Atul-Ajay) and the dance moves smack more of kitschy Bollywood rather than evoking any sense of genuine time and place. The girls in this male-dominated universe inevitably play second fiddle although Fatima Sana Sheikh, in the guise of Zarifa, whose father, Mirza Sikander Beg (Ronit Roy), is killed by Clive at the outset of the film before she finds protection under the wings of Khudabaksh, does have a few scenes in which she comes into her own. In contrast, Katrina Kaif, cast as dancing girl Suraiyya, is used primarily to liven up the song and dance routines.